PCI connects you and your organization to a world of resources that deliver results. Join PCI and put the power of your membership to work for you. 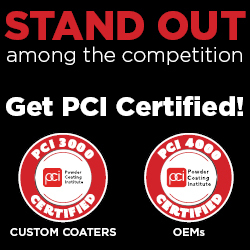 PCI invites your organization to take advantage of information, education and representation dedicated to the support and growth of the entire powder coating industry through corporate membership. Click here to join online or click here to download the membership brochure. PCI dues run January 1 - December 31.